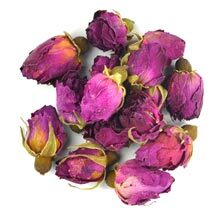 This herbal tea is made from real rose buds, plucked when they are young and then dried. It has a natural rosy taste and aroma, making it a lovely and highly enjoyable beverage. The essential oils in Rosebud Tea can help to improve circulation and is good for the heart. Our Red Rose Buds originate from Ping Yin County, Shan Dong Province. Ping Yin County is named "Home to the Best Rose" by China Forestry Department and has a long history of producing high grade roses (dating back to the Han Dynasty, 2000 years ago). Natural sweet, strong rosy fragrance and taste that calm your body and mind. This tea is suitable to blend with wolfberry, chrysanthemum or honeysuckle. Beautiful, small, dried red rose buds measuring around 1.5cm x 2-2.5cm each.